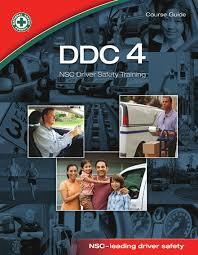 DDC 4 is a fast-paced, four-hour driver improvement program. In just a half day, DDC-4 offers practical strategies to reduce collision-related injuries, fatalities, and costs. It addresses the importance of attitude in preventing accidents, and reinforces the good driving skills students already have. Most importantly, DDC 4 shows students the consequences of the choices they make behind the wheel, and puts defensive driving in a personal context. No other driver improvement course is so widely used by business and industry, courts and government agencies, state departments, municipalities, driving schools and the military. It's one of the few driver improvement programs that offer consistent quality and content nationwide. Yet, flexible enough for us to customize the course to address driving and road conditions in your state or geographic area. An abbreviated yet engaging course reinforcing good driving skills and habits. This course makes an ideal new employee or refresher course. It offers practical strategies to reduce collision-related injuries, fatalities and costs associated with motor vehicle crashes. For information about on-site DDC training, contact us at iiscadmin@iisc.org or 515-276-4724.